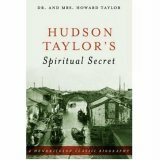 I listened to a reading of Hudson Taylor’s Spiritual Secret (Sermon Audio). I knew little of Taylor before listening to this reading. His main objective was to preach the Gospel to the millions of China. He did not seem to be a man of extraordinary gifts or attainment. However, he used what he did have to the fullest to reach those people. Though not necessarily a talented writer, he learned to write in order to inform people of the need in China, and his little pamphlet circulated in the millions. The need he wrote of was the need of the people to have the Gospel, not the financial need of his mission work. In fact, he never asked for money from anyone other than God, and his needs were always met and he operated completely without debt. He did ask for laborers for the field and hundreds responded. It took many years for Taylor to do the work he hoped to do in China, and he was at it right up until his death. Another interesting fact from this account is that George Mueller was a generous contributor to the China Inland Mission. Yes, the George Mueller that operated the orphanage in England, whose faith is noised abroad. If you know anything of Mueller at all, you know he did not have an abundance of this world’s goods. I have read the accounts of him waking up in the morning with absolutely no food for him and the children. Surely, he did not have anything to spare. So, what was he doing giving to Taylor’s work while the orphanage was running so lean? He is a testimony to selfless, sacrificial giving. Though he was doing a good work, which had many needs, he did not become absorbed and self-centered in his own work. He still reached out to others in need, remaining Christ-centered. He understood that “God loveth a cheerful giver” (2 Corinthians 9:7). He gave out of his poverty abundantly. He did not worry over this for he had the promise: “And God is able to make all grace abound toward you; that ye, always having all sufficiency in all things, may abound to every good work” (2 Corinthians 9:8).